Did pulling up nearly half of Britain’s railways in the 1950s, 60s and 70s affect where people chose to live? Did it bring about the demise of rural communities and the ascendance of metropolitan areas? While some argue that it did, an alternative view is that these changes in population patterns were already occurring and that the cuts to rail lines and stations were simply an inevitable response to unprofitability in the face of changing patterns of demand. Our new research (Gibbons, Heblich and Pinchbeck, 2018, Centre for Economic Performance Discussion Paper 1563), on the consequences of the removal of the railways –the ‘Beeching Axe’, as the cuts in the 1960s came to be known – provides some answers to this long standing question. The headline answer is that, populations in places losing their rail access declined relative to those where rail access was retained. While it is true that rail lines and stations were preserved in places where population was already growing before the 1950s, it is the loss of rail access, rather than any pre-existing population trends that explain subsequent population patterns in affected areas. These patterns had emerged by the 1980s and have persisted. If the cuts hadn’t happened, populations would have been considerably more evenly distributed across Britain at the end of the 20th Century. The London commuting area would have had 9% less population in 2001, but so would other major cities such as Birmingham, Manchester and Glasgow. Much of North West and central England gained population because of the rail cuts in the 1950s and 60s relative to areas in the South West, Wales and Scotland. The map below illustrates the what the populations of Britain’s travel to work areas would have looked like if the cuts hadn’t happened. The white and light grey areas indicate places where the population would be lower than it is now, the darker grey areas where it would be higher. So what happened to rail in the mid-20th Century, and how did this affect places’ accessibility? There had been rapid and largely unregulated growth in the supply of rail infrastructure during the 19th Century, and by the mid-20th Century, with increasing use of roads, the rail network was losing money. Unprofitable lines began to close, a process accelerated by the infamous ‘Beeching report’ - The Reshaping of British Railways 1963 - which proposed a radical programme of cuts. Figure 2 below illustrates the patterns of 1951-1981 changes in a rail accessibility index, at parish level – parish being the units on which historical census data is available. To measure rail access, we use a ‘closeness centrality’ index (sometimes called a market access index) which adds up how many destinations can be reached from an origin, with less weight on destinations with longer journey times. Bigger negative numbers mean a bigger cut. We have overlaid lines showing the rail lines that were cut from the network. The cuts were brutal. Around 40% of the lines in Britain went over this period. Even where lines were retained, many stations were closed - about 60% of them in all. 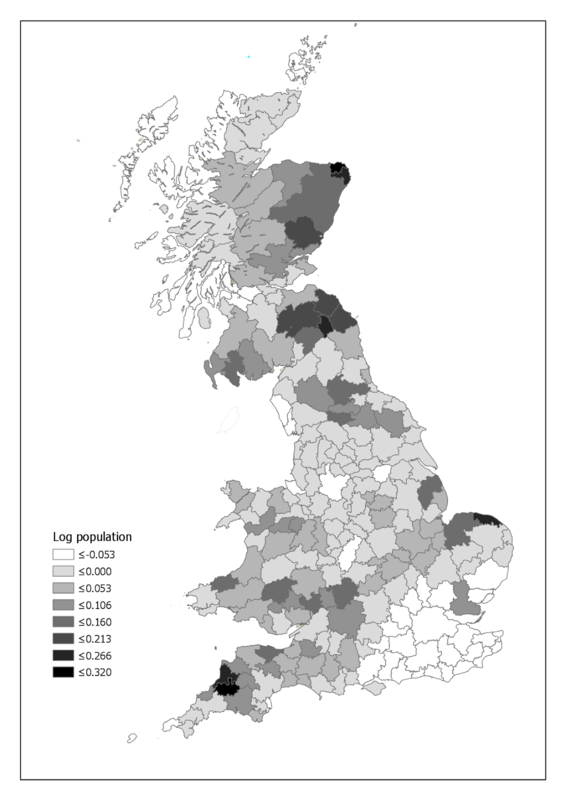 Evidently, these cuts had the biggest effects in areas outside the cities, particularly outside London and the South East (the north of Scotland doesn’t lose much either, because it had little coverage to begin with). It is these changes that we see played out in terms of population patterns in Figure 1 above, according to our statistical analysis. We also find changes in other demographic characteristics – populations in parishes losing rail access became less skilled and older. To carry out these analyses we link historical population census data at parish level to the centrality changes shown in Figure 1. 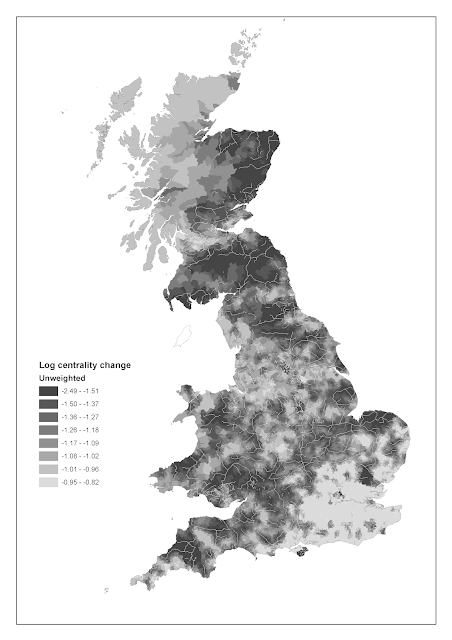 We then estimate the statistical association between the change in centrality and the change in rail access, taking careful account of pre-existing population trends, and alternative explanations for subsequent population changes – like rural/urban differences, planning of new towns, and motorways. We also check that we don’t find comparable effects for stations that were proposed for closure in the infamous ‘Beeching report’, but were never actually closed. One might think that the construction of the motorways and faster car journey would have compensated for these rail cuts. We look at this, finding that populations shifted with the construction of the motorway network too. Places that experienced improvements in accessibility through the motorway network were less affected by the rail cuts. Unfortunately, the places losing rail access were not those targeted by improvements in road access - the changes in rail and road centrality are unrelated to each other - so the motorway network in Britain would have done little to compensate the places worst affected by loss of rail. So what are the lessons for today from these historical facts? The most general point is that transport shapes the spatial economy. This probably seems obvious, but empirical evidence on the way the spatial organisation of economic activity evolves in relation to changes in transport networks is only recently beginning to emerge. This evidence adds to that picture. The unique perspective it brings is that not only does activity reorganise when transport is improved, as shown by previous evidence, but it also reorganises when transport is destroyed. Do the results mean that the opening of HS2 will cause everyone to move to the north, or would re-opening large swathes of disused railway relax the pressure on densely populated areas? This is probably far-fetched, given the shape of the modern day economy, the dominance of road and the promise of new transport technology. Though there has been a resurgence in rail use in the 21st century so the demand for rail is evidently there and, as our evidence shows, populations will shift to places with better transport access.